What is Choi Kwang Do, you ask? It is a relatively new martial art form created by a former master of Tae Kwon Do, Grandmaster Kwang Choi. Choi Kwang Do, however, bears no resemblance to traditional Tae Kwon Do with its often damaging "snap" techniques and its emphasis on competitive martial arts. Instead, Choi Kwang Do places its emphasis on self-defense and non-injurious, "natural" movements developed through Grandmaster Choi's personal experience and scientific study of the human body using biomechanical techniques. 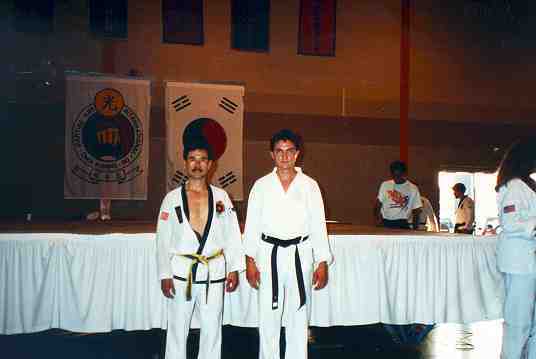 After studying Tae Kwon Do in high school and a 5-year hiatus during my college studies, I entered Master Glen Kleinow's school of Choi Kwang Do in southeast Michigan. Right after achieving the level of bo-dan, I moved to Japan and have not been involved in the martial arts hardly at all since. Now I'm back in the U.S. and keep telling myself I need to get back into it but inertia is keeping me down. Soon... soon. Back to Home Page Questions or comments?